At the turn of the century 78-rounds-per-minute (78RPM) records appeared in the “Orient” –almost simultaneously with Europe. Within a decade sound engineers working for European companies swept major cities of Eastern Europe, the Middle East, the Balkans and Asia to record performers for local markets. Gramophone records, recorded locally yet pressed in Europe, swiftly became a major commodity in global trade. This new commodity had bearings beyond its merchandise value; it did reshape music, culture, politics and economy at local, national and global scales. Moreover, the emergence of sound recording industry had coincided with historic upheavals and transformations in the near east. 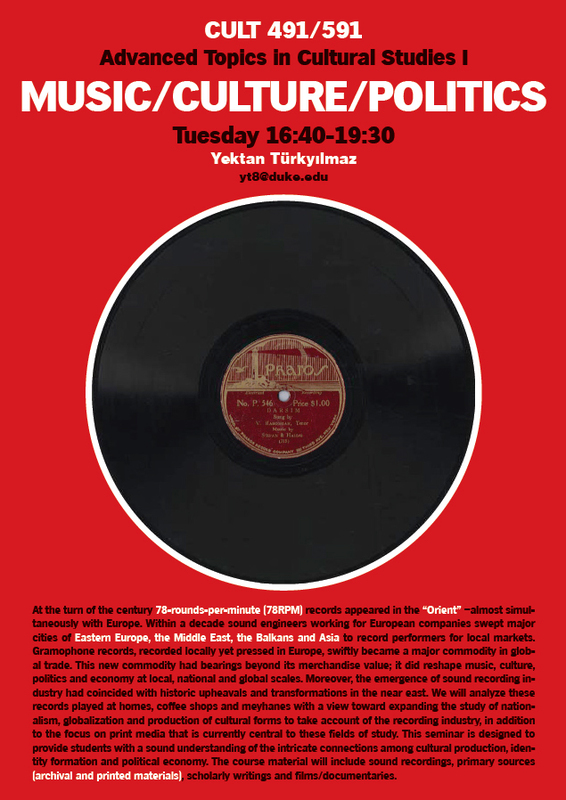 We will analyze these records played at homes, coffee shops and meyhanes with a view toward expanding the study of nationalism, globalization and production of cultural forms to take account of the recording industry, in addition to the focus on print media that is currently central to these fields of study. This seminar is designed to provide students with a sound understanding of the intricate connections among cultural production, identity formation and political economy. The course material will include sound recordings, primary sources (archival and printed materials), scholarly writings and films/documentaries.